Ibrox Noise: Are Rangers signing Senderos or not? Are Rangers signing Senderos or not? When it comes to curiously long, strung-out transfer deals, Rangers under Mark Warburton are certainly no novices. The infamous John Eustace soap opera ended up being something of legend, with the former Derby man training at Murray Park for months before the deal to secure him permanently collapsed. Publicly ‘family reasons’ were claimed, before Eustace ended up manager of Kidderminster. Along with that there have been a litany of links, ranging from Harry Winks, to Matthew Knox, to John Swift; many of the links, like Joe Dodoo, have come off, but quite a few have not, despite how long they have been connected with the switch. But here is where Philippe Senderos comes in. 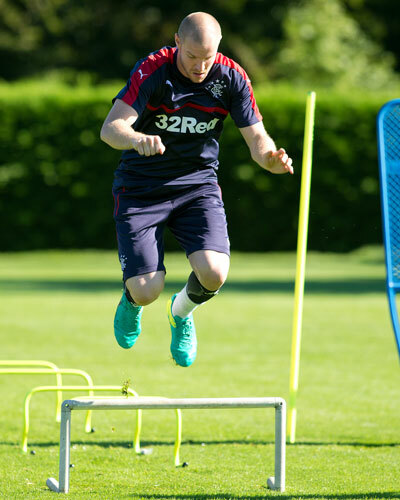 The Swiss international has now trained at Murray Park for over 10 days, in a bid to clinch himself a contract with Rangers. The word coming out of Ibrox is that everyone is impressed with him, that he has performed excellently and that he would easily enhance Rangers’ diabolical defence. The problem is the hold up. Rangers have barely a week left to sign one last player, that final piece of the jigsaw, and while claims this morning allude to the deal for him being pushed over the line over the next 48 hours, we really have to ask what the hold up is. One thing we must take into consideration is Senderos’ professionalism. After joining the ranks at Rangers’ world class training centre, the former Milan man was then bluntly informed he was not first choice, as Rangers’ management pursued the dubious Joleon Lescott. A fine player in his day, Lescott is now a disaster, a defender Aston Villa were willing to part-finance to get him off his hands. Yet Rangers were willing to sign him over Senderos, despite the Swiss doing everything right, professionally, and according to protocol? It sent out a bad sign; that said, the ex-Arsenal stopper is a pro, and despite not being first choice (Lord knows why) he has continued to quietly do his thing and plug away to win a deal, and Rangers fans can only hope one is done very soon. The Scottish press this morning make claims the deal could be in place for tomorrow’s trip to Rugby Park, but while Warbs is a master of dealing with the press, one finds that possibility hard to believe. As for what actually is holding the signing up? The Magic Hat alludes to both parties having other options, and ‘conversations’ about a deal taking time, but given how quickly most deals tend to get done once they are at an advanced stage under this regime, the delay on this one is puzzling. With a defence creaking, and Danny Wilson and Rob Kiernan evidently not being a long-term solution, Rangers need this solved ASAP. Sure, once the window is closed Rangers can still acquire any free agents, but it is a limited market and there will be a heck of a lot less of them available come the end of the month. Warbs will simply be hoping this can get pushed over the line quickly, probably with mild regret that he pursued Joleon Lescott at all; the sooner Rangers have a truly top class defender in front of Wes Foderingham, the better. Gilks-Hodgson-Crooks-Senderos-Wallace at the back on the 10th of next month would dramatically change the way we lead from the back, If we play Tavie at RB we will get murdered. Talking to my mates down Govan way the deal for big Senderos is nearly there so more improvement in the team. Myself im delighted where the team is now, Just have a think back 4 years and where we are now!!!! That's a f*cking terrible back 5 you've just posted. Thank christ you're not the manager. No they are not going sign him Senderos he is only there getting him self fit and in the shop window,move him on he wants £15/20.000 a week wage another club will come in for him i just hope it is not Celtic after we got him fit. Don't know where this enthusiasm for Crooks comes from. Seems like he has become a star not playing due to how bad the defence is but being realistic he was a league 2 player last year so could be hit or miss. Sanderos is a plank of wood... Why not offer Aberdeen £500k for reynolds, an excellent CB who is young enough for some resale and it weakens a major opponent. Get him on an £7-8k a week contract. Better than a 2 year deal for an older player who might be looking to top up his pension on £15k a week and no resale value. I cant see Aberdeen selling a player to us, look at the SH*te we had to go through with Hibs N Scott Allan. My concern is that Senderos may be happy to train at Rangers whilst his agent (he must have one)touts him to other clubs. I can't see him signing after all this time I'm afraid, and we desperately need a decent central defender. In fairness Warburton was happy to keep him dangling as he chased other targets so would not think it unreasonable if he was keeping other options open though none seem forthcoming for either him or Warburton so he will probably be signed. Just love the wages figures being thrown about like ��. Apparently Robertson has done the sums and is shitting himself as to where the money will come from after Xmas! Dunno what's happening with senderos but nobody has mentioned again thanks to a simple dummy tav let another cross into the box. Goal! Then there's wallace (the captain) that only goes forward he can't defend either why are we offering captaincy to players who don't lead by example. We have no pace at the bk. We seen it last season but warburton has left it till last to deal with? Something is not right. Our defence I in tatters. And Senderos isn't a sprinter. We better get better at scoring and dominating possession cos if we allow teams to attack were goosed. The CBS arent the only issue we don't have 1 good defender. The Senderos saga doesn't make the club look good. I'm not saying there has to be an immediate maybe hasty decision but letting it drag on doesn't show a decisive club plus it looking as if he was only signed because the Lescott deal collapsed. senderos is getting a medical tonight. he has just signed a 2 year contract. This is from a source inside ibrox. Mate heard exactly the same thing and will play a part tonight. Hope he starts with young Bates at the back. Not saying that will be a success but would like the Hat trying something different!! Unfortunately the answer is yes, he's signing. With the pace Celtic have up front our defence will be cut to pieces. Let's see if Barton can match his twitter talk on the park..........so far I'm not impressed. A £30m boost to funds plus the another £5m from the qualifiers and ICT tournament, 52,000 ST sales and £20m from sponsors .................what do we have........42,000 ST'S and hee haw else, well done Dave you are playing a blinder. Would anyone be surprised if Paul Murray appeared at the front door before Xmas to tell us that admin was on the way and that was the best way forward for the club? Yes we going be a great team now even if we have bust the bank again. Warburton is not the manager for Rangers he is too single/narrow minded one route only, every club now knows how he wants the team to play and they have acted accordingly by flooding their own half and then hit on the break as our defence is pathetic. Warbs keeps bringing in players he worked with in the English lower leagues those players are in those leagues on merit and for no other reason no decent club wants them, there are very good Scottish players who would love to play for the Jersey but Warbs overlooks all of them for inferior low league players hoping to "find a gem amongst all of them? Let big Davy Weir source our defenders he knows how good a defender needs to be to play for Rangers. Don't think 'the Hat's capable of doing something different tbh...he's taking us nowhere, that is quite apparent now.